Private lessons are one-on-one lessons with the teacher rather than a group class. You can choose to cover all styles of ballroom dancing or you can concentrate on one area - the choice is totally yours. A private lesson moves at your pace and you have the undivided attention of the teacher. 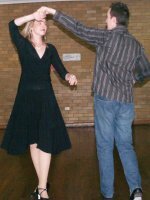 You can learn to dance for solely social purposes or if you want more of a challenge, through your private lessons you can take your medals or prepare for competition.